From Presumed Dead to Intelligence Agent… From Espionage to Celebrity… From Hunter…to Hunted… Jilly Paddock’s fantastic Zenith Alpha 4013 series featuring one of the most unique heroines in fiction continues in its third volume from Pro Se Productions-STARCHILD. StarChild is a quirky, subversive band famed for the slick visual effects in their shows. Citizens from a dozen worlds follow the band almost religiously, a cult of fans. When they’re invited to play on Ile Garoque, a world that severed all contact with Terra two decades ago, Earth Intelligence moves to plant a spy in their entourage. Enter Anna-Marie Delany and her computer partner, Zenni, a pair known for the skills and prone to danger. It seems simple enough until the lead singer refuses to set foot on the planet, so Anna must use her acting skills and EI’s technology to impersonate Taheera. What she does not expect is falling for Jeb Lucas, StarChild’s drummer and tech-wizard, nor for stumbling into a hostile first contact situation with a group of predatory aliens. All of this while her father is ill, longing for Anna to inherit his company and fortune, even though she is missing and assumed dead. The world could be Anna’s, yet she and Zenni must survive attacks from enemies within EI, capture by the venomous Xha and a pair of dragon-storms, weird elemental disruptions in non-space that can destroy unwary spacecraft. From Author Jilly Paddock, the third volume in Her Zenith Alpha 4013 series takes science fiction and espionage to galactic new heights. STARCHILD. From Pro Se Productions. 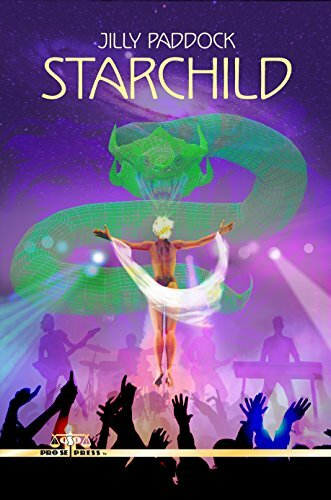 Featuring a fantastic cover by Adam Shaw and cover design and print formatting by Antonino Lo Iacono and Marzia Marina, STARCHILD is available now at Amazon at https://www.amazon.com/dp/1982082755/ref=sr_1_2?ie=UTF8&qid=1514588437&sr=8-2&keywords=starchild+paddock and Pro Se’s own store at www.prose-press.com for 15.00. The third volume in Paddock’s Zenith Alpha 4013 series is also available as an Ebook, designed and formatted by Lo Iacono and Marina for only $2.99 for the Kindle at https://www.amazon.com/dp/B078PCW8L6/ref=sr_1_1?ie=UTF8&qid=1514588437&sr=8-1&keywords=starchild+paddock. STARCHILD is also available on Kindle Unlimited for free to Kindle Unlimited members.